The flexible, Italian-made dual density sole unit has superb comfort and traction properties. Made with soft but tough breathable fake-suede micro-fibre and breathable synthetic canvas uppers. With breathable and water resistant membrane lining. 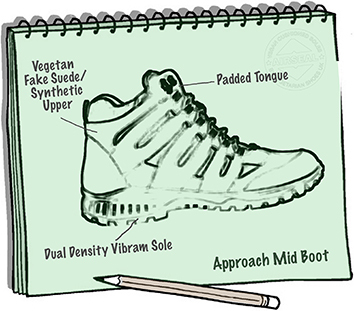 Padded insoles and tongue make this boot very comfortable and padded ankles help absorb knocks. The membrane lining needs no maintenance. The upper fabrics can be cleaned and treated like conventional suede. This style is a slightly generous fit, but most customers order their regular size.